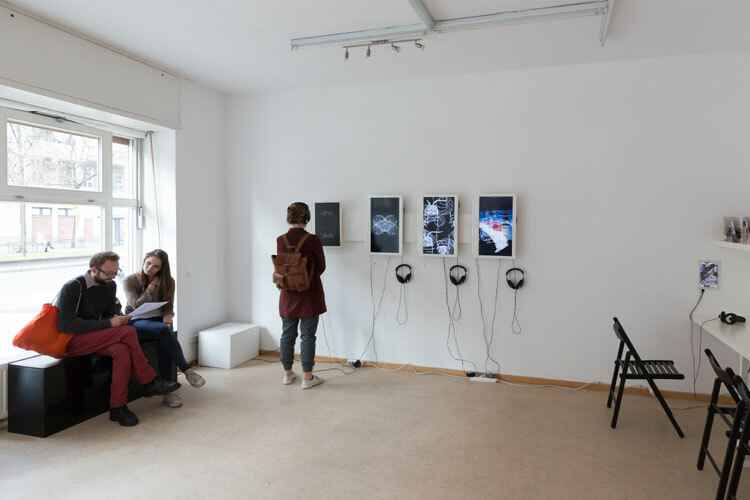 Australian artist Alinta Krauth 's new project Under-Mine (2017) was specially developed for Art Laboratory Berlin. 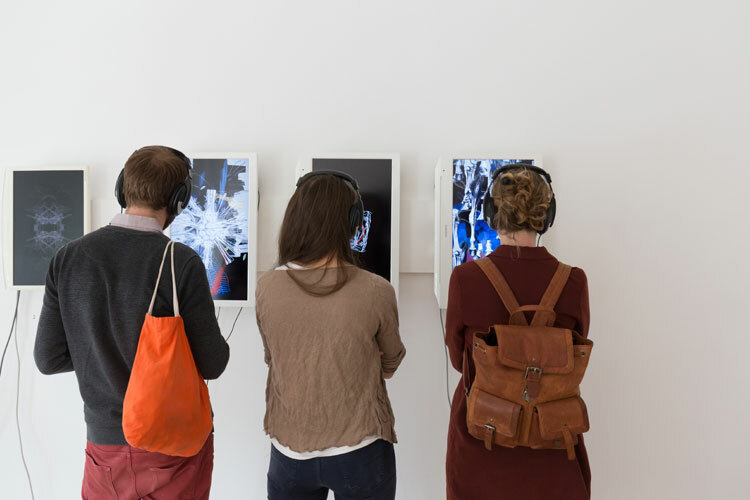 She has used video, generative art, data visualisation and an intensive study into the science of animal perception and cognition to propose narrative paths towards a meeting point of the human and nonhuman. 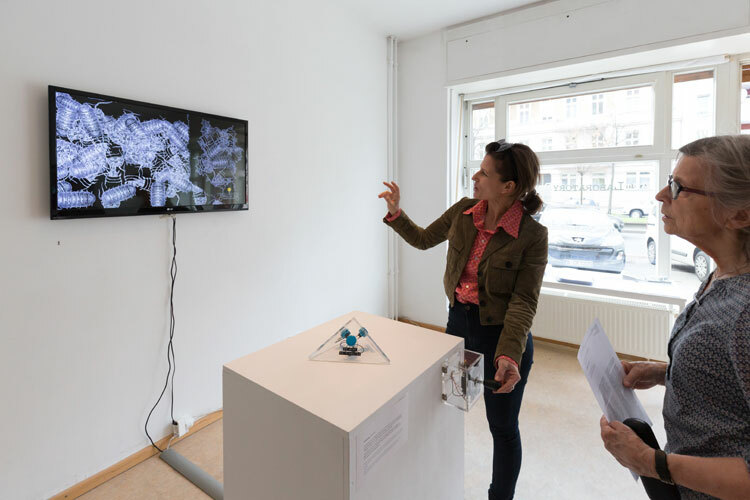 Taking into account that each species' way of sensing the world is unique, and often beyond the ken of human experience, Krauth makes use of a diverse technological toolbox to navigate and translate nonhuman perceptions. 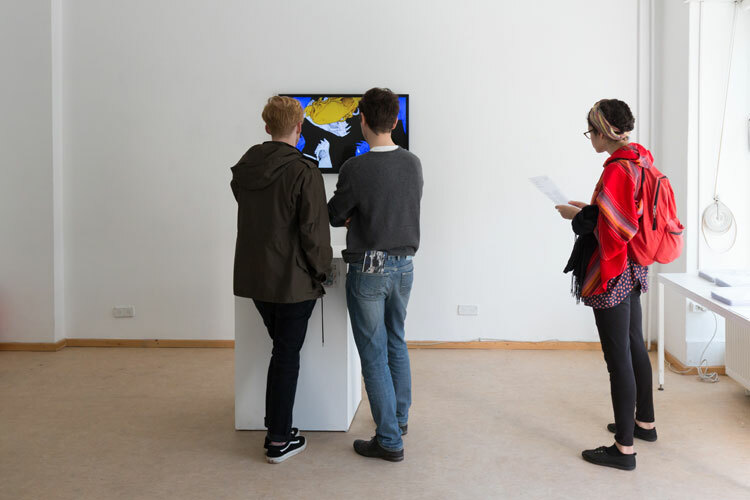 The video installation Under-Mine on the right wall invites the viewers to reflect on four creatures and their attempt to survive a species die-off - the microbat, the rock lizard, the woodlouse and the wild horse. This narrative is set out as a timeline: from acceptable climate levels to catastrophic. 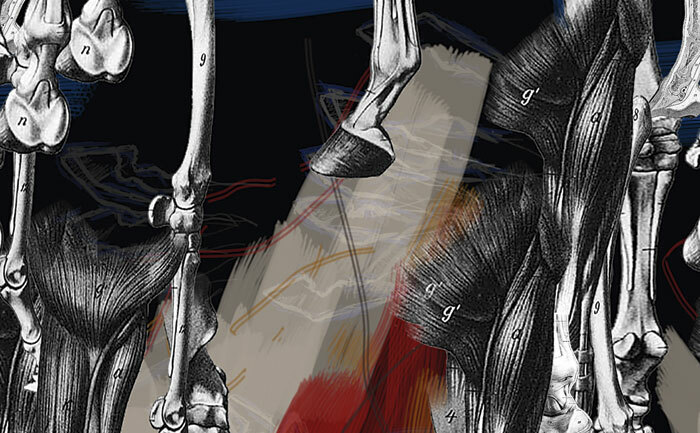 The viewer navigates the world as the creature undergoing sensory change. The higher the level goes, the more the world becomes confusing, faster or slower, more abstracted. 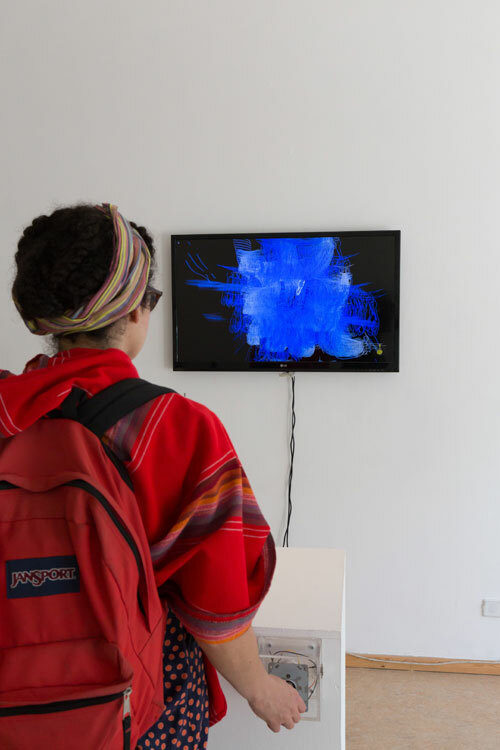 The artist created these computer animations by means of data generated video and sound, hand drawn animation, and digital interactive elements, introducing abstract visual and aural perception as language, interaction with an immersive environment, and a sense-oriented, rather than linear narrative. 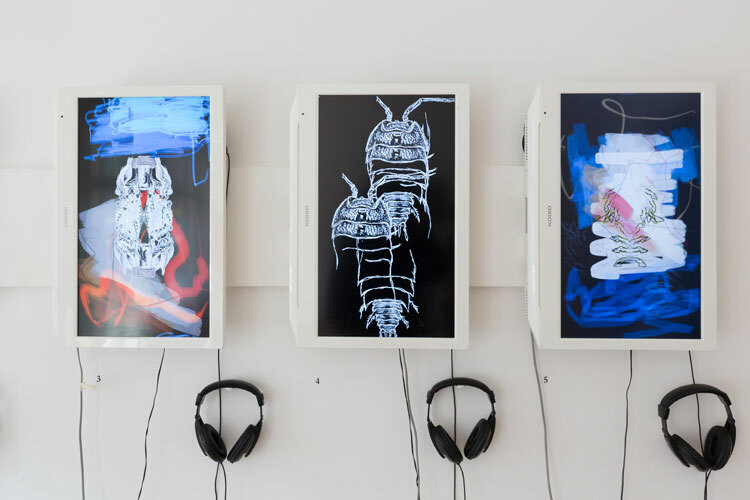 The four computer animations on the left wall aesthetically reflect the issues of climate change for each of the four chosen species and their particular types of perception: specifically chosen are echo-locating micro-bats; rock lizards who use chemoreception to identify territories and suitable mates; woodlice, who use their ability to sense humidity as a decision marker for movement and location - this hygroreception is not the only sense they use to control movement, thigmokinesis and phototaxis also play roles; and proprioception in the case of the Kaimanawa wild horse of New Zealand. Another digital sketch reflects about further species. There are many other creatures whose senses will be, and are being, affected by the human-made changing climate. Some examples are sea turtles with their ability to return home using magnetoreception. Some species of fish are losing olfactory cues that allow them to forage and sense predators. For the computer animations Alinta Krauth used a mixture of frame-by-frame animation, time-based code-generated animation, and digital drawing. Due to their computer-generated nature, the original interactive versions will never play the same way twice. 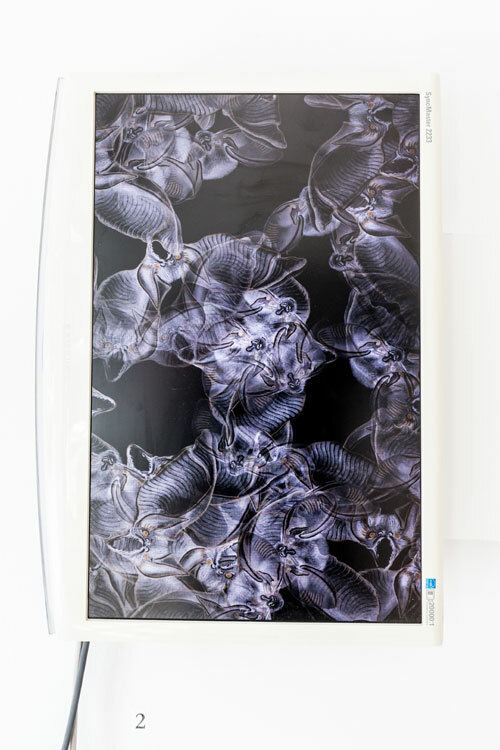 They are a conversation between the artist who creates the imagery and sets the parameters, and the computer, which executes those parameters. Accompanying sound is also created by the artist, using a mixture of field recordings, data-generated sound, and postmodern notation techniques for composition.